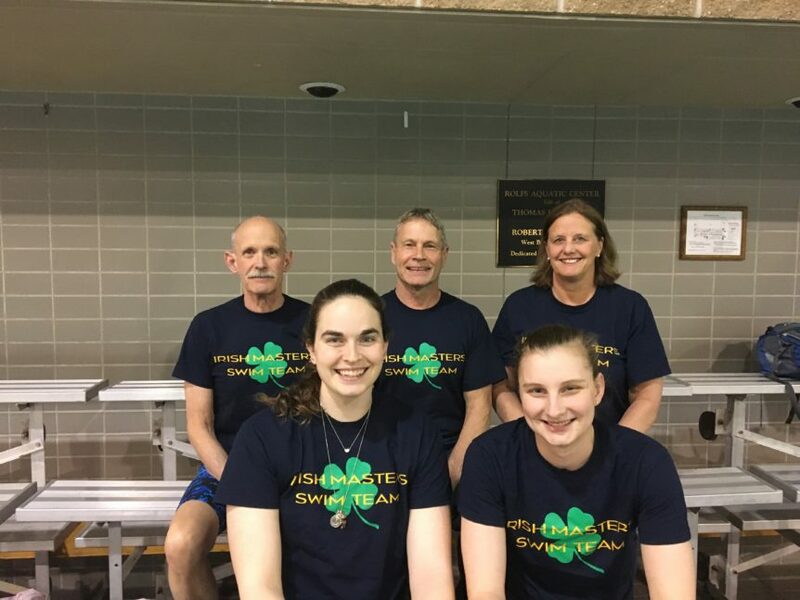 Good luck to the nine Irish Masters swimmers who will be attending the U.S Masters Swimming Spring Nationals at the Indiana University Natatorium in Indianapolis, Indiana, on May 10-13. This is the largest group of Irish Masters swimmers to attend a National swim meet since this group has started. The youngest swimmer traveling to Indianapolis is 24 years old and the oldest is 65. Fernando Alamos, 25 years old; competing in the 100 meter Freestyle and 100 meter Individual Medley. John Cleaver, 65 years old; competing in the 50 meter Backstroke, 100 meter Individual Medley, and 50 meter Freestyle. Hannah Estes, 24 years old; competing in the 1,000 meter Freestyle, 100 meter Backstroke, 100 meter Freestyle, 100 meter Breaststroke, and 50 meter Freestyle. Chris Gilde, 26 years old, competing in the 200 meter Breaststroke, 50 meter Freestyle, and 100 meter Individual Medley. Madeleine Lakatos, 57 years old, competing in the 500 meter Freestyle, 200 meter Freestyle, 100 meter Freestyle. Larry LeMaire , 65 years old, competing in the 100 meter Butterfly,100 meter Individual Medley, 200 meter Individual Medley, 50 meter Butterfly, and 50 meter Freestyle. Peter Nogel, 28 years old, competing in the 100 meter Freestyle, 50 meter Backstroke,and 100 meter Individual Medley. Margaret Regan, 26 years old, competing in the 1,000 meter Freestyle, 400 meter Individual Medley, 200 meter Breaststroke, 100 meter Breaststroke, and 200 meter Individual Medley. Sherry Sill, 57 years old, competing in the 400 meter Individual Medley, 100 meter Backstroke, 200 meter Backstroke, and 50 meter Backstroke. The goals for the various swimmers include, top ten finishes, receiving medals, achieving personal best times, making some new connections, and most importantly to have fun. The Irish Masters team garners 30 swimmers, the biggest collective group they have ever had. The group swims at the University of Notre Dame on Monday, Wednesday, and Friday nights, as well as Sunday afternoons and welcomes all levels, from those just beginning to experienced swimmers. For more information on joining the Irish Masters, contact Sherry Sill at ssill1@hotmail.com or ask to join the Irish Masters Facebook page.